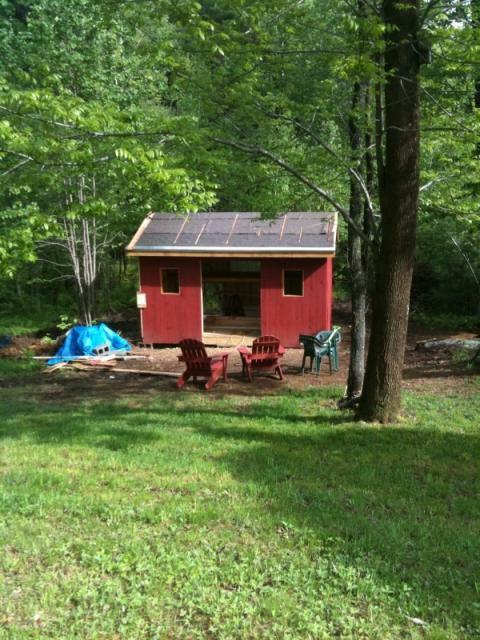 Well,,, It's started anyways.... 10' x 16', A double door in the front, 2 small windows to each side of the door,, Well, they are not really opening windows like normal,,, just the sashes.. so we will have to have hinges.. My hubby desided to have them swing out, For ventilation purposes. 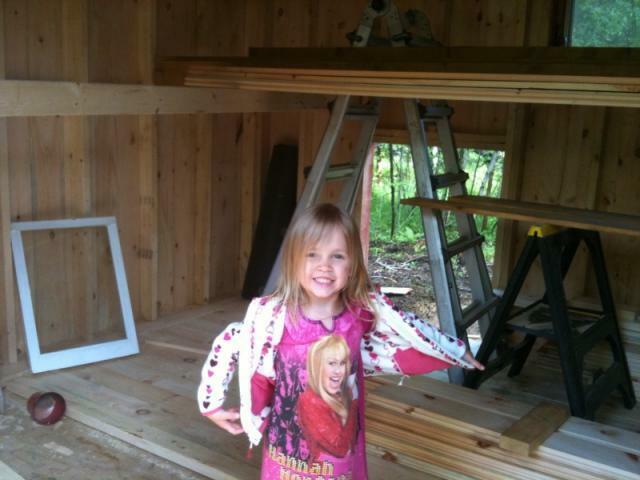 We have another window in the center of the back wall that opens up from the bottom, hinged at the top. We are hoping that this will be enough ventilation along with enough sunlight for heat for our Maine seasons.. We desided not to insulate just yet. Because Chickens tend to produce heat and moisture,, we felt that Nature in itself knew enough to arm the chickens with the proper climate attire, We probably didn't need to go overboard, just let our little chicks do what is natural.. Need to deside the stain/color,,,, Originally didn't want to stain a color but the wood isn't right off the plaining block, so keeping it's natural design isn't in my hubby's plan,,, Myself, I think its perfect...But, Because we went with the ReStore/Habitat place,, we have inperfect/unmatchedwood siding,, sooo it has to be a color.. Or my hubby will go crazy everytime he looks at it~.. I must tell you.. the ReStore place has been a godsent,,, we have gotten soo much stuff there for our little mini me barn... Its been good stuff and we saved a ton of $$$.. Stuff isn't perfect, but it certainly does the job.. My husband is ALL about "good" and "semitry"! Sooo It's off to our coop design forum for some idea's. Here we are at the middle of May, Chicks are getting bigger and almost ready to go into their house,,, I have the temp down to 80 degrees, I'm going to try to get them to 70 by Memorial weekend... by then I think they will be NEEDING to get out of the Kennel.. I have no doubt the coop/pen will be ready.. Seeings how I JUST got the call telling us that the piglets are in and ready to be picked up ! 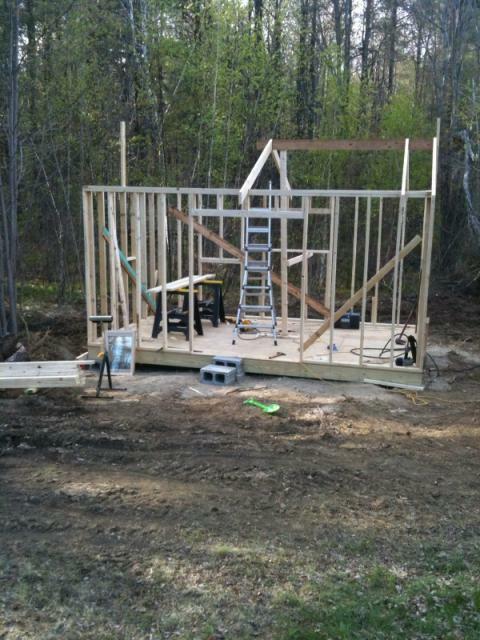 Scroll down and tell me what you think... DO YOU THINK THE MINI BARN IS READY FOR THE PIGS....... Heck noooo ! ! Any guesses as to what we are doing this weekend ! 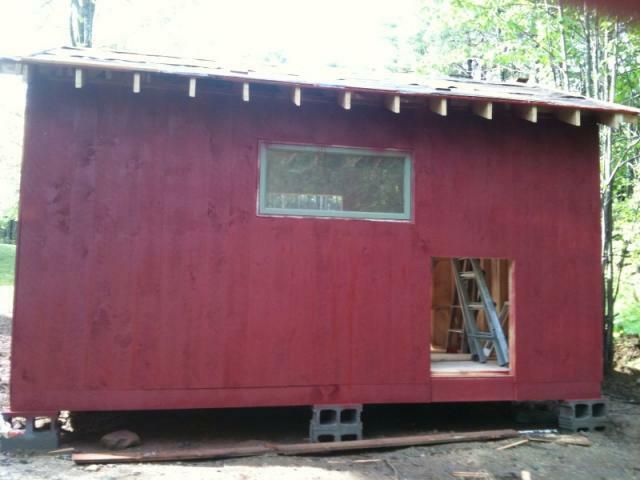 We desided on "Barn Red" solid stain for the exterior, and "Antique Brass" for the trim and the doors. This is the back of the Mini barn... the pig door is there but he hasn't cut out the chicken door yet.. That will go to the left.. This is our little darlin Grandaughter,, Taelor. I took this this morning.. She is all excited and ready for Cozy Crest Farm ! 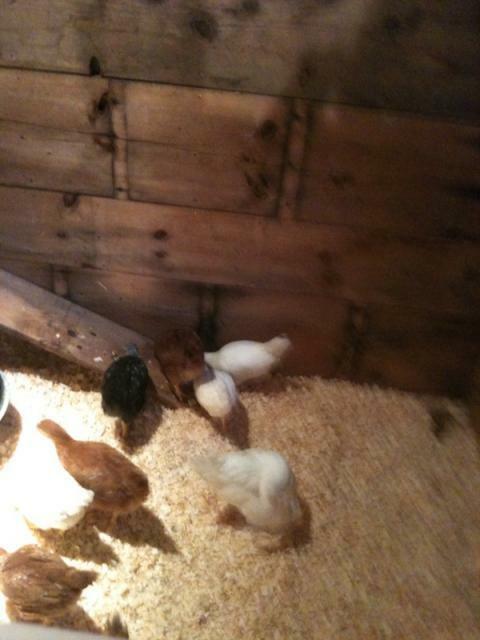 First day in the new coop,, 11 hens and 1 rooster. First week in June. Nice fluffy coating of fresh shavings... their section of the mini me barn is 6x10 with 8 nesting boxes.. Hope they like their new home..! 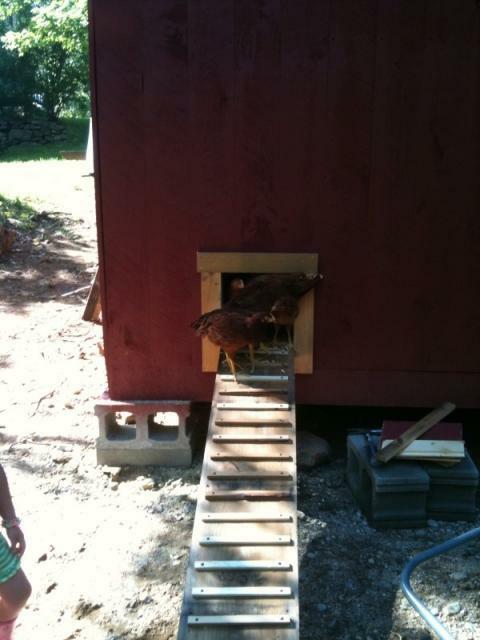 First trip out of the coop..
Free ranging while we are still working on the homestead... It's going to take a while to get "Cozy Crest Farm" into shape.. But for now,,, I think they are diggin it! 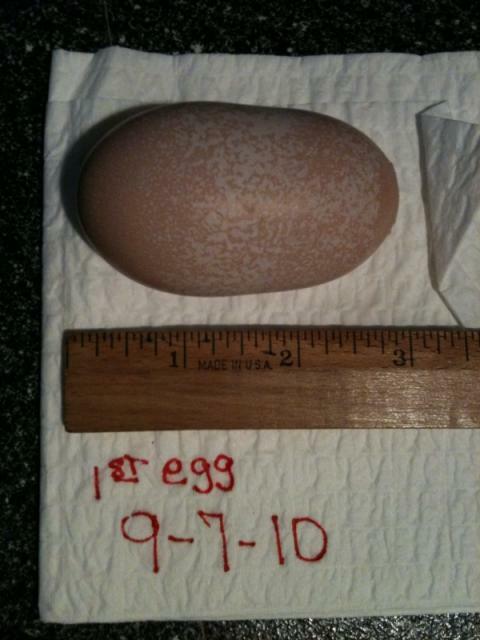 Our first egg.. I wish I knew who the lucky lady was.. After reading all about the events leading up to the first egg, I figured that the time was coming. There was all kinds of cackeling going on yesterday..And I hear it today as well... However nothing yet... But look at that egg folks,, Isn't it marvy..? 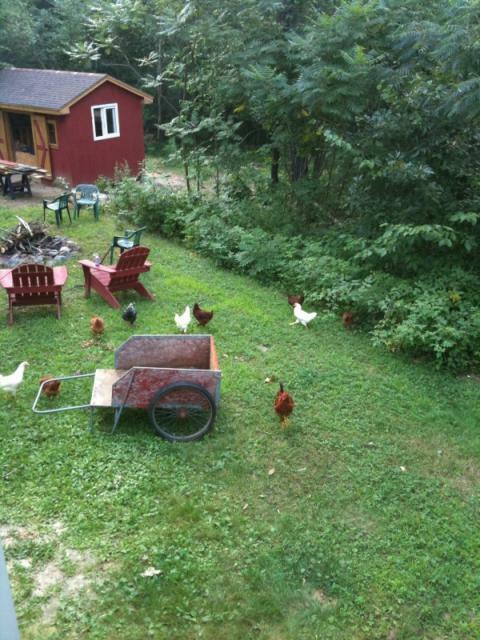 Well, it's been a year now with our ladies,,, since then we have lost one rooster, and one hen.. the rooster was our doing,, and the hen fell to the hands or claws if you will of a hawk... That was horrible, but now they are all fenced in, we put up a 16x24 covered chicken run. We searched out Uncle Henry's and Craigslist for freebee's and deals and managed to enclose around with chainlink fencing for under $150.00 and covered it with chicken wire... 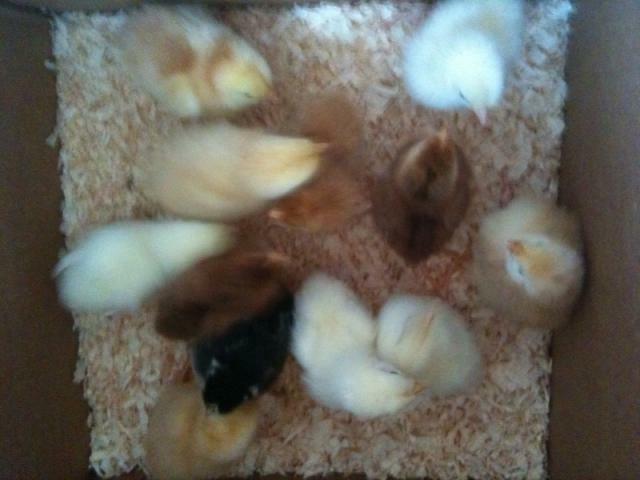 So now they are safe.. We let them out free ranging on the weekends when we are home.. This year we purchased 24 meat chixs, the feed store gave us 4 chixs that were not doing well in the area with all the others so we got a total of 28,, within the time frame of then and now, we lost 4... but they are growing like mad.. If I could post a pic again,, I would show you, but for some reason, this is not an easy task any longer..! Not a lot of details but a nice coop. "Great looking mini barn but would love more detail"
I love the beginning pictures, just wish you had more details of the space for the chickens in the barn. It looks nice though just would love more info. I love the amount of space that this coop has. The ventilation is also very good. I would recommend this design for anyone with around 20-30 chickens.